If you belong to the cult of app developers for Android or are trying to get there, we got just the thing for you. App stats let you know how your apps are performing. They also give you differentiated data based on countries, platforms devices etc. 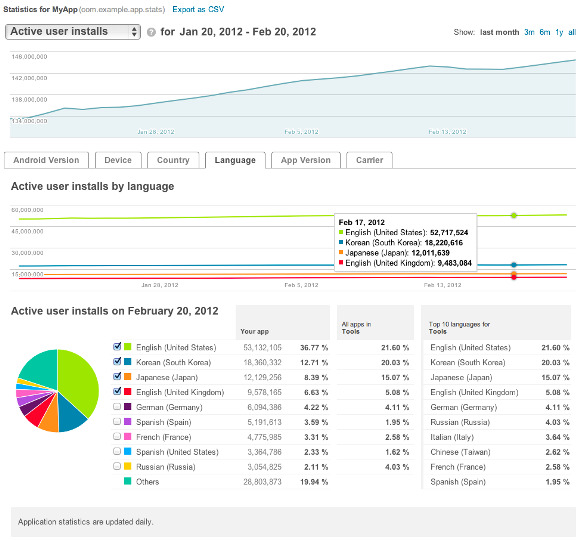 App stats have gotten even better this tie with publisher data, new metric, analysis and a revamped UI. We explain the improvements in detail. Adding new metrics to your dashboard shows you app penetration by unique users and unique devices. The installs have been divided into 4 categories – active installs, total installs, daily installs and uninstalls. The devices tab will show you active and daily installs, uninstalls and upgrades. Two new dimensions have also been added called the carrier and app version. This one can be used to track app installation by mobile operators or by specific updates. Drawing inspiration from Google Analytics, there is a timeline feature, which lets you see data over time and shows a chart for all metric and dimensions. These charts can be used to track the long-term performance of your app. Besides; you can add your specific points to the timeline (such as languages) to sort it out your way. The whole thing is integrated into a new UI that makes app stats easier and faster to use. You can check your application statistics here.